The Orange-Senqu River riparian States (Botswana, Lesotho, Namibia and South Africa) are committed to jointly addressing threats to the shared water resources of the Basin. 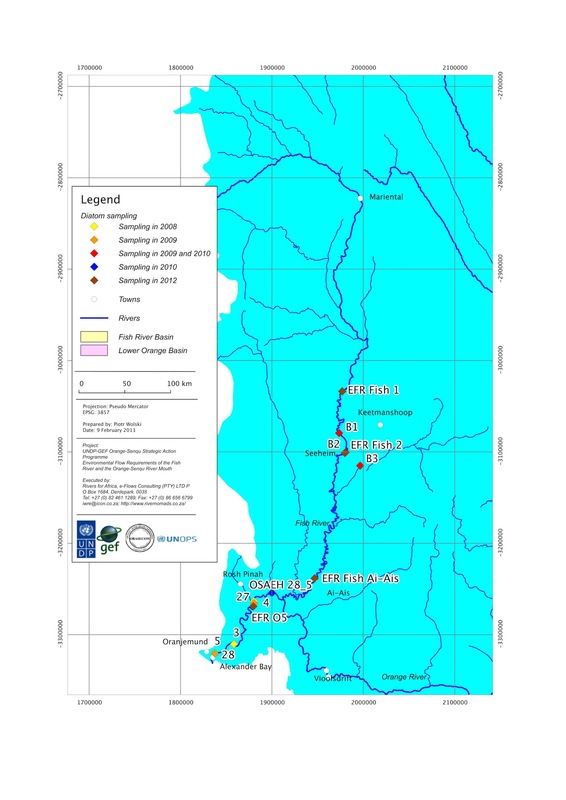 This is reflected in bilateral and basin-wide agreements between the riparian states and led to the formation of the Orange-Senqu River Commission (ORASECOM) in 2000. The ‘Orange-Senqu Strategic Action Programme’ Project supports ORASECOM in developing a basin-wide plan for the management and development of water resources, based on Integrated Water Resources Management (IWRM) principles. The water resources of the Orange-Senqu River are heavily utilised and the system is highly regulated with 23 major dams within its Basin. 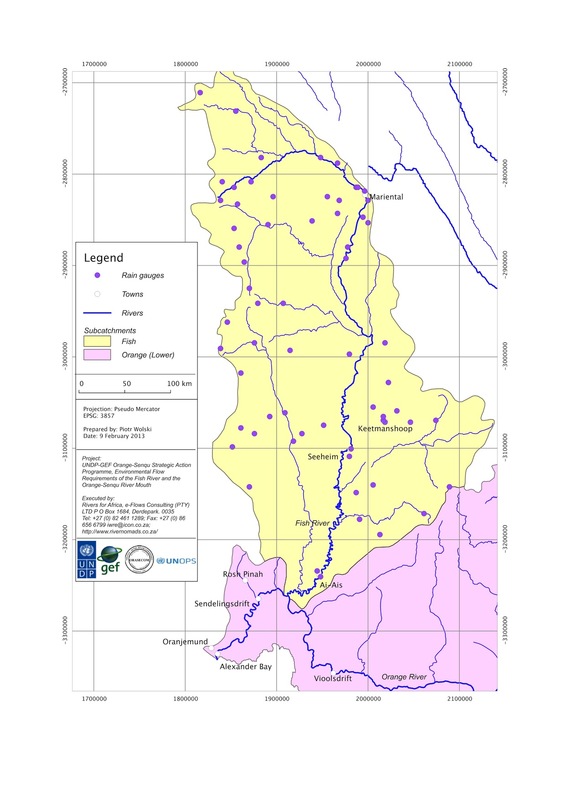 It is also connected to other river systems for water import and export via six inter-basin water transfer schemes. 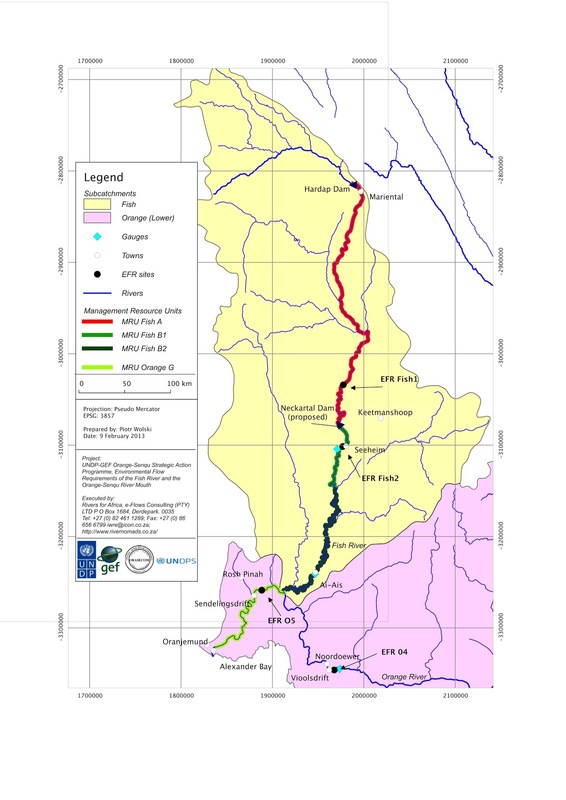 The project presented here addresses Environmental Flow Requirements (EFR) of the ephemeral but nevertheless significant Fish River, and the Orange-Senqu River, from its confluence with the Fish River downstream to the Orange-Senqu River mouth. This section of the basin has not been covered in any detail by the earlier studies carried out during 2009-2010. The need for establishing the Environmental Flow Requirements is becoming increasingly` urgent due to the fact that two large dams, one in the Lower Orange (Vioolsdrift Dam) and one in the Lower Fish (Neckartal Dam), are at an advanced state of planning. Project's on-line map presents all spatial data generated during the project. The map is hosted on the WIS geoserver system. The map provides interactive access to spatial data and attribute data associated with spatial features. Results of the EcoStatus model that integrates assessments for individual biophysical components of the system, as per Kleynhans & Louw (2007). Results based on 2012 surveys. Results of assessment of Ecological Importance and Sensitivity according to methodology by Dr CJ Kleynhans (DWAF, 1999, updated in 2010). Results based on 2012 surveys. Fish Response Assessment Index (FRAI) according to Kleynhans (2007). Index determined based on 2012 surveys. Geomorphological Driver Assessment Index (GAI) according to Rountree and du Preez (in prep). Index determined based on 2012 surveys. Index of Habitat Integrity (IHI) assessed for the instream and riparian components, according to Kleynhans et al. (2009a). Index determined based on 2012 surveys. Results of assessment of river health with a method developed for this study, which was based on a number of key ecological traits that were rated and weighted in terms of their importance in defining the Present Ecological State of benthic macro-invertebrates. Physico-chemical Drivers Assessment Index (PAI) according to Kleynhans et al. (2005) and DWAF (2008b). Index values based on 2012 surveys. Riparian Vegetation Assessment Index (VEGRAI) according to Kleynhans et al. (2007). Index determined based on 2012 surveys. Results of assessment of riverine fauna conditions under the flow scenarios based on a process developed especially for this project. The main components of this process that are considered comprise the expected riverine fauna species to the area, their probability of occurrence and quality of habitat present. Assessment done on the basis of survey performed in June 2012. Diatom abundances at projects sites surveyed in 2012, and at other sites in the basin surveyed between 2008 and 2012. Fish catches in the Orange River Estuary. Macrophytes present in the Orange River Estuary. Fish counts at projects sites surveyed in 2012. Macroinvertebrate counts at projects sites surveyed in 2012, and between 2008 and 2012. Model configuration and results of modelling of Fish River hydrodynamics in the Neckertal-Ais-Ais reach. Data stored in the native HEC-RAS format. These are parameters of Pitman model obtained during model calibration. Model configuration and results of modelling of Orange River basin with water management model WRPM. Data stored in the native WRPM format. Model configuration and results of modelling of Fish River with water management model WReMP. Data stored in the native WReMP format. These are monthly rainfall amounts for each of the subcatchments simulated in the Pitman model. The data were derived from observations at individual stations, which were interpolated and converted to subcatchment-area monthly totals. Data cover the period of Oct 1930-Sep 1995. These are river discharges at a number of 'nodes', or outlets of subcatchments, simulated with a calibrated Pitman hydrological model for current conditions in the basin. The simulations cover the period of Oct 1930-Sep 1995. Sata presented here are disaggregated using statistical methods from monthly output of the Pitman model. These are river discharges at a number of 'nodes', or outlets of subcatchments, simulated with a calibrated Pitman hydrological model for current conditions. Current conditions - cover the period of Oct 1930-Sep 1995. Pitman model is run at monthly time step, and data presented here are monthly. Files contain either 'incremental' flow, i.e. flow generated within subcatchment corresponding to a node, or total flow, i.e. flow generated upstream from a node, or, in case of dams, spill flow. 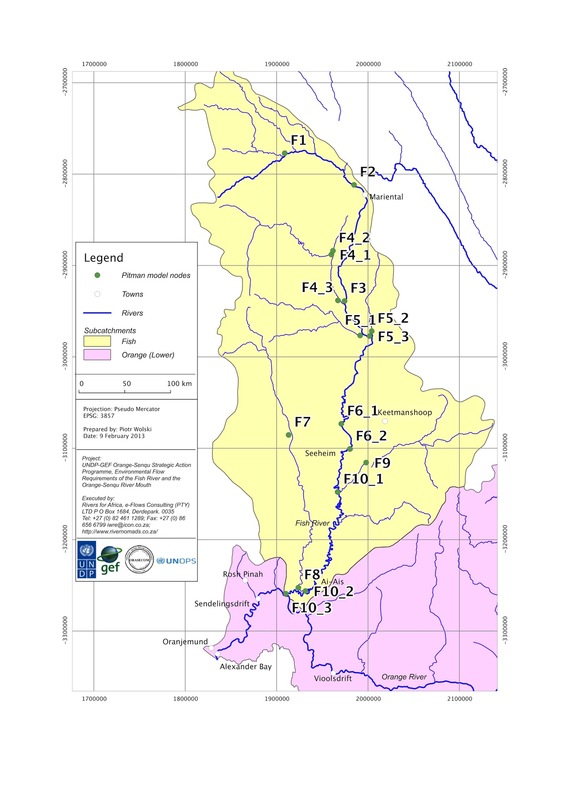 These are river discharges at a number of 'nodes', or outlets of subcatchments, simulated with a calibrated Pitman hydrological model for prescribed water management and development scenarios. The simulations cover the span of 66 years. Data presented here are disaggregated using statistical methods from monthly output of the Pitman model. These are river discharges at a number of 'nodes', or outlets of subcatchments, simulated with a calibrated Pitman hydrological model for prescribed water management and development scenarios. The simulations cover the span of 66 years. Data presented here are monthly. These are results of measurements topographic transect, water level and flow discharge at cross-sections at core sites. Results of granulometric analyses of sediment samples from a number of locations within the Orange River Estuary. Locations of sampling sites not georeferenced. Results of water quality measurements from a number of locations within the Orange River Estuary. Shape files presented in this website contain attribute tables that store refrences to data files pertaining to each of the georaphical feagures. The shapefile metatdata contains description of column names of these attribute tables. It is a Comma Separated Value file that can be read with a text editor or opened in MS Excel. Basemap of the project. 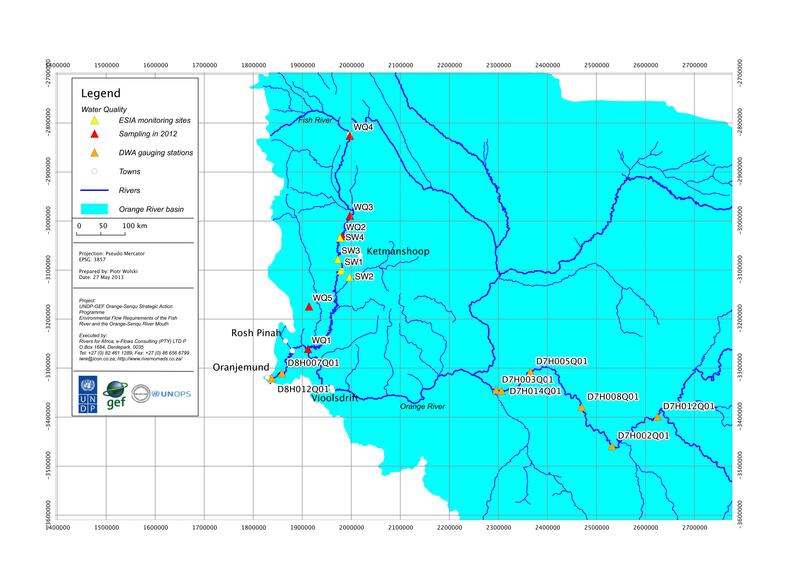 Shows location of the study site, subdivision of the rivers into Management Resource Units, gauges etc.